Just eight miles north of Perth, Trigg Beach is a white sand haven for surfers, boogie boarders, swimmers, snorkelers, and visitors just watching the waves. One of the best places in Perth for surfing, the swimming here can also be good on days when the surf is down—just be sure to stay between the flags that mark the designated swim zone. The beach is separated into two different parts by a large, limestone “island,” which in reality is connected to the coastline by sand but is nevertheless known as Trigg Island. The southern side of the limestone island is the best for surfing and wave riding, whereas the beach just north of the limestone point is the southern boundary of Marmion Marine Park and better for snorkeling and swimming. On shore, there’s a scenic and popular beach café with a view looking out at the waves, or you can also picnic at the neighboring park, complete with BBQ grills. Insider's Tip: For unforgettable views of Trigg Beach, hop in a helicopter and cruise the coast to see the beach from the air. 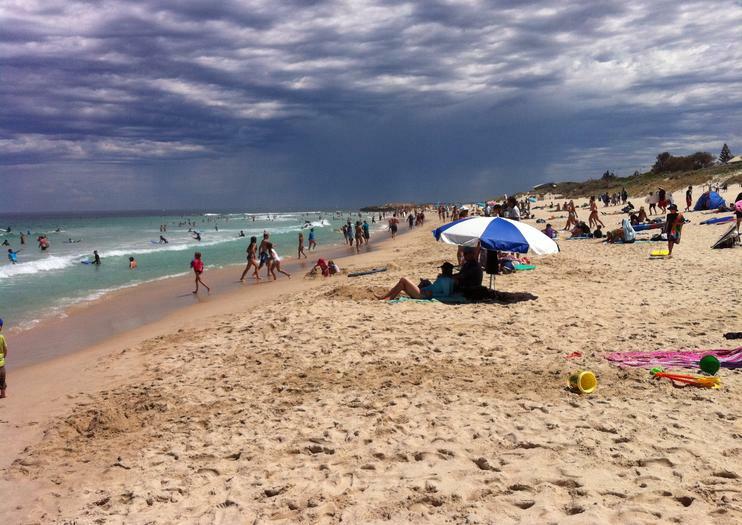 Trigg Beach is about 20 minutes from the center of downtown Perth. Mornings are usually the best time to visit since the afternoon sea breezes blow most afternoons and the sun can be hot at midday. Parking can sometimes be difficult in summer, and while professional lifeguards help keep everyone safe, only strong, confident swimmers should consider getting in the water. Experience the excitement of a helicopter flight on an aerial tour of Perth. Take off from Hillarys Boat Harbour and soar along the coast on a thrilling 8-minute flight. Listen to live commentary from your pilot as you enjoy a unique bird’s eye view of Perth’s landmarks, the Sorrento, Trigg and City beaches, and the winding Swan River.